The designation of a bacterium as “Gram-positive” is based on the reaction of the organism in the Gram stain test. This test quickly classifies bacteria into two major groups, Gram-positive and Gram-negative, based on the structure of their cell walls. 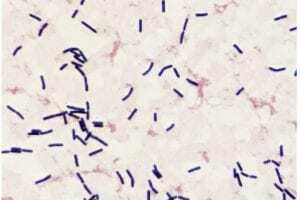 The cell walls of Gram-positive bacteria consist of a thick peptidoglycan layer which retains the crystal violet (blue/purple) stain whereas Gram-negative bacteria possess an outer membrane. This difference in cell wall structure translates into differences in how these two groups of organisms behave in the environment. Gram-positive organisms tend to be more resistant to drying due to their thicker cell wall, but more susceptible to cleaning agents due to lack of an outer membrane. However, Gram-positive organisms that form spores are highly resistant to both drying and cleaning agents. The concentrations of Gram-positive bacteria in indoor environments depend on a number of factors. These include the number and activity levels of individuals in the space, the types of clothing worn by individuals, the ventilation rate of the space, the presence of animals, and the presence of standing water. In ISO-classified areas, the main source of Gram-positive microbial contamination is personnel and, to a lesser extent, materials transfer and infiltration of contaminated air. At U.S. Micro Solutions, our microbiology laboratory is a licensed, accredited source for thorough, cutting edge environmental testing, including USP 797, Legionella, indoor environmental testing, healthcare & medical testing, water analysis, and identification of specific pathogens. Visit our Laboratory Services page to learn more. Give us a call at 724-853-4047 or contact us online via our Contact page. © 2019 US Micro Solutions. All Rights Reserved.